The United Nations negotiations on the post-2015 development agenda in New York came close to a political declaration in the face of many challenges. A broader framework based on the agenda will be included in a separate document and all of these will be adopted at the UN Summit during 25-27 September 2015, called "Delivering on and implementing a Transformative Post-2015 Development Agenda". The main challenges to sustainable development which are global in character include poverty and exclusion, unemployment, climate change, conflict and humanitarian aid, building peaceful and inclusive societies, building strong institutions of governance, and supporting the rule of law. Protecting, restoring and promoting sustainable use of terrestrial ecosystems; sustainably managing forests, combating desertification, and halting and reversing land degradation and biodiversity loss by 2020. There are several lines of argument that have arisen from the above. Charles Gore, a member of the UN Millennium Project’s UN Experts Group, has observed that the translation of the Millennium Development Goals (MDGs) to SDGs has led to the reduction of these broader goals into national aims, which could in fact harm the achievements of the SDGs that involve policy discussions, issues of universality, the gains of a partnership approach, the principle of common and differentiated responsibility and mechanisms of accountability. The report of the Secretary-General on managing the transition from the MDGs to SDGs emphasises how reducing inequality ought to be recognised as a guiding principle for the post-2015 agenda around which the SDGs may be integrated. The principles of Common but Differentiated Responsibility (CBDR), and of Universality but with Differentiation have both been called into question by several developed countries. The key role of the private sector, questioned repeatedly by most civil society groups, continues to be a bone of contention. Brazil, for one, is worried that "undue emphasis on partnerships minimises the primary responsibility of States, while overplaying the role of the private sector." Brazil also wants the developed world to take the lead for sustainable consumption and production patterns, promoting sustainable management of natural resource bases in general. It feels that that the developed countries must consider the universal nature of goals while planning domestically for their respective nations. Brazil also maintains that the political declaration must renew the commitment of leaders to support more legitimate and representative institutions of global governance, which can better handle the increasing complexities of the world today. On the other hand, developing countries, represented by the Group of 77 and China and groupings of the Least Developed Countries (LDCs), the Small Island Developing States (SIDS) and the African Group strongly demand that the SDG document be accepted along with the aims and objectives in the political declaration. The G-77 wishes for a declaration that is "guided by the Rio principles of Common but Differentiated Responsibility, promoting capacities and circumstances for development among countries. The group believes that the declaration should emphasise the need for fundamental changes in the way societies produce and consume, which are indispensable for achieving global sustainable development. India wants to give full respect to the agreed-upon principles and ideas that have been accepted by member states in recent times. It is important for the country that the principle of common but differentiated responsibility be accepted in its entirety and it does not wish to renegotiate the Rio+20 consensus. However, ideological support notwithstanding, the huge gap opening up in India between the amount of natural resources that the country uses and the amount that it possesses is alarming. This mounting natural capital gap was reported by the Global Footprint Network even as India is struggling to deal with the global financial crisis. India now demands the bio-capacity of ‘two Indias’ to provide for its consumption and absorb its wastes, according to a report released by Global Footprint Network and the Confederation of Indian Industry (CII). India’s ecological footprint, based on the amount of productive land and sea area required to produce the resources to meet its consumption demand and absorb waste, has doubled since 1961, according to the report. While India as a whole demands a significant percent of the world’s bio-capacity, its per-capita ecological footprint, at 0.8 global hectares, is smaller than that of many other countries, and well below the world average of 2.2 global hectares. Indeed, the ecological footprint of many Indians may need to increase to allow for sufficient food, shelter, electricity, sanitation, medicine and material goods. The United Nations estimates that India’s population will reach 1.7 billion by 2050. In that case, the country is likely to face a widening ecological deficit even if its current per-capita levels of resource-consumption remain the same. Therefore, for Indian society to continue to prosper in an increasingly resource-constrained world, business and government leaders must work actively to protect the natural capital on which India’s economy, and all human life, depends. 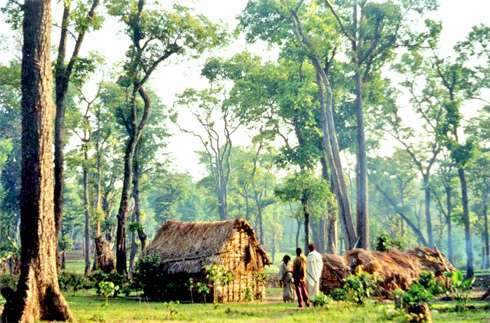 In national and international debates on SDGs, the interests and livelihood of the poor and tribal people, which depend largely on access to common resources such as forests, water bodies and grazing lands, are woefully neglected. The commons, on which these sections depend often for their very survival, cannot be allowed to fall prey to pollution and the pursuit of unregulated private profit. India has to first put its own house in order before it can lead the developing world and the BRIC block with conviction in SDG dialogues and other negotiations. An important fact to note is that those who normally negotiate on behalf of our country are Foreign Service officers with limited knowledge of complex environmental and ecological issues. They get transferred regularly, often before they can get a hold on the issues involved. It might be better to include experts and environmentalists who understand the issues better and have more skilful negotiating skills than the civil services personnel. In comparison with India, Brazil has shown better presence of mind and understanding of the issues related to SDGs and has made some apt suggestions, thus securing a kind of leadership status which India should have been able to match. In this context, India could have proposed that that sustainability and human development need not be contradictory to each other but can complement each other in measurable terms. For example, in the Human Development Index 2011, development indices such as education, health, gender equity and economic standards of living were combined with the ecological footprint calculation to come up with a common framework of evaluation. This framework could be a model for all nations to follow and India can show the way by including it in its plans and policies. There is no excuse anymore to say that it is difficult to measure and correlate sustainability and human development or that they are inherently contradictory. In the case of Costa Rica, a small country of Latin America, the happiness and wellbeing of its people has been shown to be one of the highest in the world precisely because it has been able to bring together these indices. It has thus created a flourishing, happy and contented society as we understand from many studies and reports, the most recent being the Global Happiness Report from the United Nations. Roberto Bissio of Social Watch, an international network of citizens’ organizations, points out that: "The most striking feature of the SDG ‘elements’ is that ‘development’ is only mentioned when developing countries are being called to generate an ‘enabling environment' presumably for the corporate sector while the Global Partnership for Development is reduced to a mechanism to discipline developing countries to implement the required governance changes and to promote the partnerships with the private sector!" Bissio points out that efforts are being made to reclassify the goals into the following categories: those that are nationally defined; those that apply universally; and those that "leave no one behind" but at the same time "balance and integrate the social, economic and environmental dimensions". He asks, "Who is going to rearrange the SDGs under these categories and for what purpose?" In a joint paper, noted development economists Sakiko Fukuda-Parr and Desmond McNeill warn that the SDGs, like the MDGs, could reduce democratic discussion because the language and discourse of development debates can be too technical and depoliticised. Their argument is further supported by Robert Bissio when he asserts that such a premise, as well as all the other rights enshrined in the Universal Declaration, be treated not just as an aspiration but as international law. There seems to be a divergence of opinion between the rich and the developing countries over the fact that the former, while demanding universal standards of evaluation, also wish to detach from the Rio agreement in order not to be bound by stringent requirements to cut back on emissions drastically. At the same time they are worried about contributing substantial funds for developing green technology to the poor and the so called developing world, the SIDS and the LDCs. The others including India, China, Brazil and several other majority groups feel that the agreement framework for achieving SDGs should hold the rich world responsible for past consumption and pollution and take ownership for the same. They should share the benefits of their growth more equitably so that the poor and BRIC countries can, to some extent, equalise the disadvantages they have suffered historically due to economic exploitation and climate change caused by environmentally unsustainable growth strategies in the rich countries. For a fairer world, we need to form and respect democratic international institutions of governance which represent the interests of all sections of the global society. We also need ongoing consultations to build a consensus and bring divergent views together for the sake of our common humanity. All this has more to do with creating a new vision of civilisation than coming up with a technical or organisational or even financial quick fix. This is the vision that we ought to be looking at while finalising the Sustainable Development Goals to save our planet.